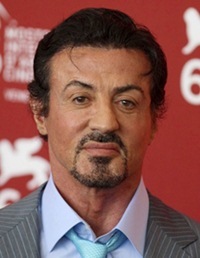 Sylvester Gardenzio Stallone is an American actor, film director and screenwriter born on 6th July 1946. Known for his roles in action movies, Stallone began his career from the film The Party at Kitty and Stud’s in 1970. Afterwards, Sylvester performed several minor roles in different movies but in 1976 he got a breakthrough role in the blockbuster film Rocky which provided him international fame and success. Later on, Stallone worked in numerous hit films including First Blood, Rambo: First Blood Part II, Judge Dredd, The Expendables and Escape Plan. But the two major roles of Stallone which received critical acclaim were Rocky Balboa of the Rocky series and soldier John Rambo of the Rambo series. Besides acting, Sylvester Stallone also worked as a director and his debut film as a director was Paradise Alley and after that he directed lots of films such as Saturday Night Fever, Rocky Balboa, Rocky II and Rambo. Furthermore, he is also recognized as the boxing promoter and has a boxing promoting company named Tiger Eye Productions. Coming towards his personal life, Stallone married to Sasha Czack but they divorced after ten years of relationship. The couple had two children. Later on, he married to an actress Brigitte Nielsen but their marriage lasted for just two years and afterwards Stallone married to Jennifer Flavin with whom he has three children. Listed below are complete actor Sylvester Stallone body measurements including his height, weight, chest, waist, biceps and shoe size. Oil painting is one of Stallone’s hobbies. The left side of actor’s face is paralyzed including parts of his chin, lip and tongue. Sylvester Stallone wrote the script of his hit film Rocky (1976) after three days of watching Muhammad Ali-Chuck Wepner fight. I have always wondered if people who dabble in bodybuilding really have any idea how much harder a person who is say 6’2″ and taller has to work and how much more muscle mass is needed to “appear” to have the muscularity of someone in the 5’10” range. 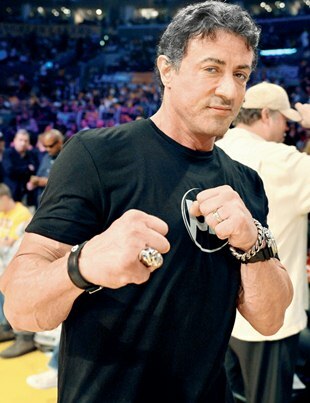 Just look at Stallone who appears so large in pictures but weighs 185lbs. He is also 5’10”, at most! Schwarzenegger is probably just at 6 feet, though is said to have measured as tall as 6’2″. For Arnold to look like Sly he has to weigh in at 260lbs minimum. Think about that, it’s nearly 20 pounds for each additional inch of height. Of course, only those who know of the work it takes to be a bodybuilder care or respect the point I’m making. All of which is laughable to most, but pay attention. The bulky look that went out in the 90s is on its way back to popularity!